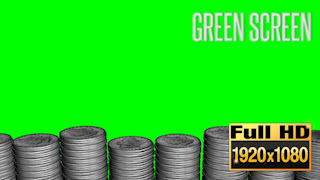 Green Screen video showcasing Silver Coin Stacks. Can be used as overlay in your videos by removing the green/blue screen. Works great with Camtasia Studio (PC&Mac), Adobe Premiere, Adobe After Effects, Final Cut Pro, Sony Vegas, Corel Video Studio and most other video editors. Easy to remove the green screen in most video editors.